Anna and Calle Wikner, two engineers who met while studying in Lund. They came up with the idea of making their own craft gin while living in Vancouver, Canada in 2015. The hang out spots for friends around here was local breweries and small distilleries which lead them to question why there wasn’t any distilleries in Stockholm? Being passionate gin drinkers they started to gain and look for knowledge on distillation and how to create the perfect gin. Anna and Calle didn’t waste any time, they bought a small chemistry lab and started distilling all kinds of botanicals. At the same time, they travelled the Pacific North West to visit as many of the local distilleries as they could, meeting passionate gin distillers who gladly shared their experiences. 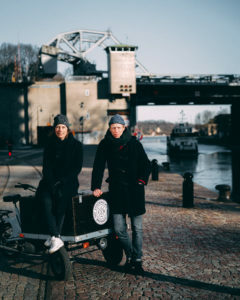 They started the company while still living in Vancouver since the delivery time on the pot still was long, now all they had to to when moving back to Stockholm was finding a suitable place to distil their gin. This was easier said than done since they wanted a place where the public could see it as an open meeting place, like they were used to in Vancouver. After more than 10 months and 100 visits around Stockholm, they found the perfect location at Södermalm. During the search for this place they got to know the four guys behind Modernist Brewery who were on the lookout for a new location as well. This lead to Folkungagatan 136, an old jaguar work shop, that now is the place to visit when you want to learn everything you can about gin and beer! 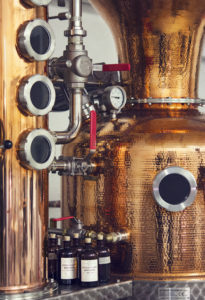 The gin is made in a beautiful 350- litre copper still named “Fåfängan”. The production is small and every bottle is given a unique batch and bottle number. Since the definition of gin is a spirit with juniper berries and “other botanicals” the combinations are endless. Stockholms Bränneri Gin is inspired by the Nordic flavours and surroundings. The idea of using one of the main characters come from the heather meadows out at Torö where Anna and Calle got married. 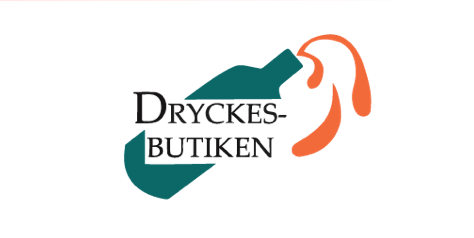 On December 1st 2016 they released the first 1000 bottles through Systembolaget and the success was a fact when it sold out within the first 24 hours. With this being said, we are very proud to present the only distilled spirit made in central Stockholm! A dry gin made from Stockholms Bränneri. It has a fine juniper and citrusy nose with smooth aromatic flavours from the elderflower and heather but also a depth coming from the coriander, angelica root (Kvanne) and rosemary. It’s a straight forward and honest gin with clear Nordic influences. 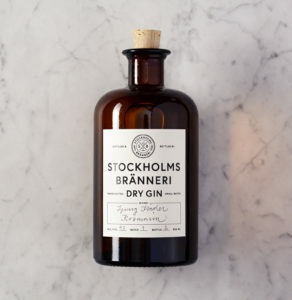 Stockholms bränneri gin is certified organic, the ABV is 40 % and comes in a 500 ml bottle.